DeQuervain’s tendonitis or “tenosynovitis,” is a common condition involving the tendons on the thumb-side of the wrist. The syndrome is named after Fritz de Quervain, a Swiss physician who described the condition in the late 1800s. 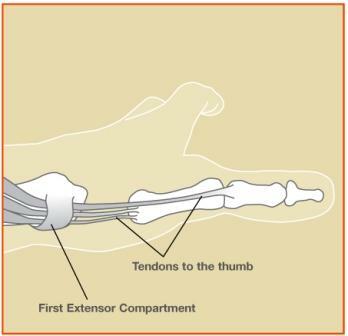 Symptoms arise when there is entrapment of the tendons of the thumb by their surrounding sheath at the wrist. Instead of gliding smoothly through the sheath, the abductor pollicis longus (APL) and extensor pollicis brevis (EPB) tendons can meet resistance. Over time, these tendons may become irritated and painful. Certain movements of the thumb and wrist can be excruciating. Patients may feel a tender bump or notice swelling in the wrist where the tendons and/or sheath are thickened. Lifting objects, gripping, or pinching with the thumb often exacerbates symptoms. The cause of DeQuervain’s syndrome is usually unknown, but symptoms can be aggravated by starting a new, repetitive activity. The condition is common in young females, especially pregnant and post-partum women. Lifting a young child can be very painful making it hard to care for the newborn. DeQuervain’s can be diagnosed by history and physical exam in the office. An x-ray can sometimes be helpful to rule-out other conditions, such as arthritis or wrist fracture, but this is not required in many cases. Finkelstein’s test can help confirm the diagnosis. During this exam test, the patient places their thumb into their palm and wraps/clasps their fingers around the thumb. The patient then moves their wrist in the direction towards their small finger, reproducing their pain (which can be excruciating!). therapists can teach stretching exercises and reduce pain with treatments such as iontophoresis (anti-inflammatory medicine delivered through the skin). Corticosteroid injections (“cortisone shots”) are very effective in relieving symptoms in many patients. One or two shots are often recommended, although multiple injections should be avoided as they can cause weakening of the skin and soft tissues over time. If these measures fail to improve the symptoms, surgery may be recommended after several months of non-operative treatment. DeQuervain’s release surgery is performed to improve the gliding of the tendons with the goal of reducing pain and improving function. During this outpatient procedure, the tight sheath (extensor retinaculum) is opened through a small incision on the thumb-side of the wrist. This can be performed under local anesthesia with or without sedation. If you would like to be treated for your DeQuervains wrist tendonitis, please call the Raleigh Hand Center to be evaluated by a hand and upper extremity specialist. Image and video provided by the American Society for Surgery of the Hand.